I recently had a chat with a colleague who recounted his recent experience with a computer he recovered from a local electronics recycling center. His story was a bit shocking and I thought it really deserved a write-up. Electronics waste is a huge burden to local governments around the world. The pace of advancement in the electronics industry means that the replacement of televisions and computers is becoming more and more frequent. Local communities have responded by setting up collection and drop-off points which are serviced by electronics recycling firms. The drop-off points are usually located in public works yards and have with no discernible limit on who can use them or what they’re allowed to leave. I know from experience that my local drop-off point fills up fairly rapidly, despite only being open during public works hours (weekdays-only, closing fairly early every day). It’s great for the residents and also the local IT departments and consultants. Capturing this volume of recyclable material takes a huge burden off our landfills and yields a significant amount of useful valuable content ranging from metals (steel, aluminum,etc.) to precious metals and rare-earth minerals used in the manufacture of electronics goods. It’s a win-win for everyone involved. Because these drop-off points are usually unattended, they also serve as electronics pick-up points. As the saying goes, one man’s trash is another man’s treasure. People dispose of perfectly good technology all of the time, and my colleague admittedly struggles to leave with less than he drops off! 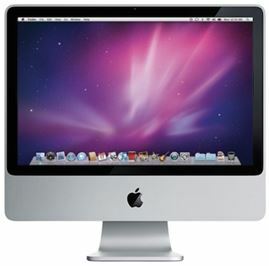 On a recent visit, he found a very attractive 2007 vintage 20″ iMac. That was a bit of a rare find so he snagged it and brought it to his office. He attempted to power it up but found that it would not load the operating system – most likely due to hard drive failure or corruption. No problem, he merely changed out the hard drive with a spare and reloaded the operating system. Apple makes this very simple to do, freely providing the latest version of the operating system in the Apple Store. He spent a couple of hours geeking around and before long had a very useful iMac gracing his desk. Sweet! Personal documents – homework, work docs, etc. This should horrify anyone concerned about identity theft. The odds of this happening to you are likely small. The potential for harm, however, is huge. Businesses could give up industry trade secrets, customer lists, credit card numbers, personally identifiable information, and even legal or medical information. The latter could result in significant fines since, technically, it would be a reportable breach the moment a computer containing protected health information left their control. You need to beware of recycling old computers unless you are 100% certain they contain no sensitive data. If nothing else, remove the hard drive and keep it somewhere safe. You never know – the data might be needed someday. Free hard drive shredding programs are also available though their use is beyond the skill set of the average user. Even locating the hard drive and getting it out of the computer exceeds most users’ abilities (especially on that iMac!) The best practice is to trust your local I.T. expert to retrieve the hard drive and securely shred the information. We offer this service to our clients whenever we retire and recycle their old computers and servers. This provides the peace of mind that the most intimate details of your personal or business life will not fall into the wrong hands. In the case of my colleague, the fact that he is a security conscience individual was a stroke of luck for that local family. Due to the sensitivity of the data, he promptly shredded the data and recycled the old hard drive.